IHS 51 students can participate in a Masterclass for free! Please fill out the Masterclass Application Form to apply. 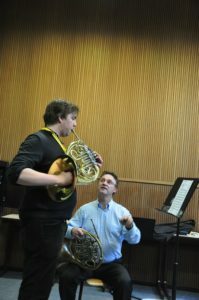 Masterclasses are available for all level of horn players. There will be dedicated masterclasses for Wake the Dragon participants. Please indicate specific topics you would like to apply for in the “motivation” section of the application form. To access a masterclass marked with an asterisk (*), please send in a 5-minute audition recording to masterclasses@ihs51.gent .